Some people know to take life as it comes as they go about their daily routines, juggling home and work. And then, there are others for whom finding meaning in mundane routines is awkward. Shoojit Sircar’s October beautifully portrays the life of one such person who is not able to deal with circumstances, just as they are. 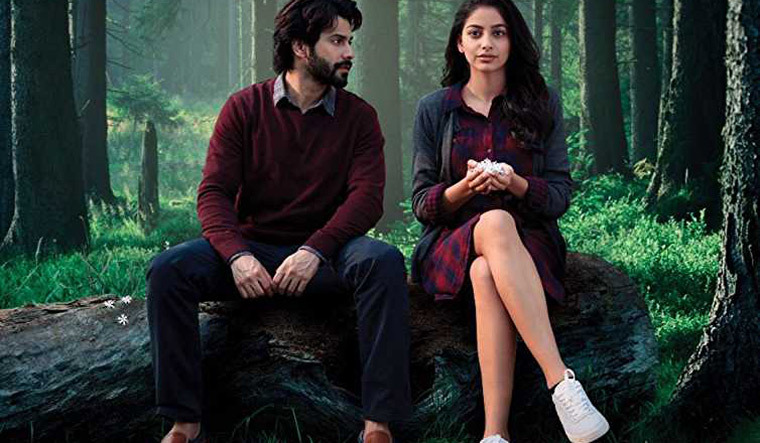 Dan (Varun Dhawan), a hotel management trainee at a five-star hotel, is unable to find peace in any of the varied profiles given to him over the few months of his training. He is switched from cleaning and cooking to laundering sheets and taking orders at the table. He finds it difficult to feel at ease like most of his other classmates—if they have found peace waiting at tables, they don’t mind wrapping towels and bed covers either. But Dan just can’t. “You are frustrated,” one of his friends tells him. He dreams of opening his own restaurant and joining the “startup movement” like the rest of the world. But before this could happen, one of his friends, Shiuli (Banita Sandhu) meets a fateful accident, leading to a comatose state. Her last query was about Dan. Dan is affected by his friend's condition, but the fact that the last Shiuli spoke was about him, disturbs him even more deeply. “Where is Dan,” she had asked. And for Dan, it was important to know why she had asked for him. Dan goes to hospital everyday in hope of finding an answer. And before he realises, this becomes a habit—taking care of Shiuli and even observing the little progress she makes over time. While Dan is on his journey to discover life which is full of unpredictability and situations in which giving up seems to be the only option, writer Juhi Chaturvedi subtly infuses other elements of life. Chaturvedi has earlier indulged us in stories of a sperm donor (Vicky Donor) and an old man’s bowel movements (Piku) with quirk and humour. With October, she delivers a treat which even without similar quirkiness or humorous life-like situations, compels you to look at the ultimate truth—death—with much calm. In the midst of the silence and the graveness of death, the story subtly weaves in the extreme emotional turmoil a family goes through when one of their own ends up in a hospital. The film also takes us through relationships developed over time in an unlikely place like a hospital—with the doctor, nurses and other staff . One of the lovely relations explored is that of Dan and Shiuli’s nurse, convincingly portrayed by Nimmy Raphael. Some intense observations are made in the few scenes that feature both of them—nobody marries a nurse, she tells Dan and gives a reason—because they are required to touch a patient’s body, literally everywhere. This puts their character under the scanner, she says. Random thoughts like this are tucked into the film all along. And these are not meant to be explored in-depth. In life too, you don’t dig deep into everything—some thoughts are left unanswered while regular life goes on. Gitanjali Rao who portrays Shiuli’s mother, is an embodiment of grit. She has lost her husband and has moved on with her three kids before her eldest ends up in hospital in a comatose situation. The film doesn’t establish anything about her husband’s death, but Rao’s nuanced acting does. She has lived with the reality of life and will live with it all over again, but not before giving it one more chance. And Dan becomes her support. While covering these nuances of life, Sircar also captures the changing weather, which couldn’t have been better anywhere else but Delhi. As a symbol of the changing time, he focusses on October when Shiuli or jasmine blooms. He delivers a masterstroke with the casting. Banita Sandhu, even if in a vegetative state for most part of the film, keeps it simple and doesn’t go over-the-top while playing her part. The beauty of Varun Dhawan's character is that he doesn’t try too hard, probably following the cue of his director diligently. And thus, he is convincing enough as a 20-something clueless guy, making remarks that don’t really have to make sense. And then, there is Avik Mukhopadhyay’s cinematography which makes all the difference—even when dealing with the dark edge of life, he keeps it bright while the melancholy is brought in with Shantanu Moitra’s music.